@harry_rag, we are on the recruitment charge for new contributors to this thread so hopefully will have some more voices thrown into the mix. A full set of fixtures this week. 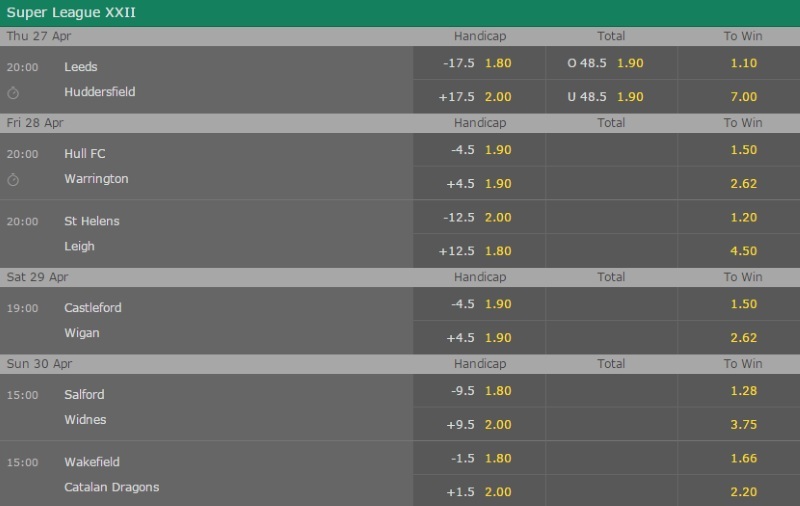 What do you fancy betting on in these games? @Labrador, fancy getting involved too? I'm inclined to agree with the RP that there should be sufficient reaction from Huddersfield for them to stay within an 18 point handicap tonight but no bet on that for me. Have followed on Parcell to score a try for an interest though. Advised at 15/8, I took 9/4 with Spreadex who are now 2/1 best price. Well, I didn't see that coming with Huddersfield winning by the margin they were expected to lose by! Still, at least Parcell was among the tryscorers. RP tips for tonight are Warrington +6 and St Helens -10.5. They also mention the expected return from injury of Matty Russell for Warrington. He scored a hat trick against Hull a few weeks ago and appeals at 2/1 anytime with Spreadex when the next best is 13/10. A trio of bets with Spreadex for me on Cas v Wigan. Gale to score a try at 12/5, >45.5 points at evens and >55.5 at 3/1. Any game involving Cas has the potential to be a points fest and it's backable for me at those prices. Gale 2/1 at most elsewhere and looks worth a shot for an attempt at 3/3 try scorer bets this weekend! 7 winners from 8 bets mentioned in this thread so far, with just the RP tip for Warrington +6 failing to oblige. I've had the good fortune to go 5 from 5 with winners at 9/4, 2/1, 12/5, evens and 3/1. Will post later if anything appeals today. The RP advise Salford -10. Left it late but will chance my arm with an interest in Dobson anytime for Salford at 5/2 with Betfred. 5 tries this season and 2/1 or less everywhere else. And a couple for Wakefield, both with Lads. Jones-Bishop at 11/10 and Grix at 5/2. I'd say a shade of odds on and 2/1 at most would be about right but, as I say, all a bit hasty and just for an interest. Just the one winner from 3 today, Jones-Bishop at 11/10. A decent weekend overall though.